Final Fantasy is the granddaddy of all RPGs and is often cited as the series that kick-started the whole genre. Final Fantasy II was released in 1998 and expands on the success of the first. Now Square Enix has ported the classic fantasy RPG to the iPhone for an old school trip down memory lane—with your trusted sword. The graphics look well, fantastic on this little screen. The main difference between FFI and FFII is the leveling system. Final Fantasy II no longer bases its leveling system on gaining experience points to advance your characters to the next level. Instead, the more you do certain tasks, the more proficient you become at them. For instance, if you use swords to fight with, you’re sword skill will go up and eventually you’ll do more damage. The more magic you use the more powerful your spells become. The more you take damage, the more your hit points increase. This type of character development lets you tailor your characters in any way you see fit—instead of the conventional format of having you characters locked into specific classes. Any character can use any weapon or magic spell as well as equip any item or armor. As the genre has evolved, one can appreciate how rare a game Final Fantasy II is. The premise, however, is not particularly earth-shattering. You play as a group of three orphans whose parents were killed by enemy soldiers. They set out to find a missing friend and the epic story line unravels from there. As you guide your party, you'll explore the world by completing quests, fighting monsters and crawling through dungeons. If you played the original Final Fantasy II game you’ll see that this port to the iPhone has remained pretty faithful. Everything is the way you remember it except for the new touch interface and some enhanced graphics. I was extremely pleased with the interface in particular—it's very clean and easy to navigate. Moving around is handled by using a virtual D-Pad on the left and a sprint button on the right. When it comes to fighting you just tap a melee, magic or item button and then your target. Of course you can tap the flee button to attempt to run away as well. The graphics in this Final Fantasy II port are an improvement over the original but still have that 16 bit look to them. Accompanying the nostalgic graphics are the original sound effects and musical score that were so cool back in the day. Final Fantasy II is an epic RPG adventure not for the casual gamer. The story line is quite deep with lots of reading, questing and talking to villagers. While there are lots of different monsters to fight as well as some cool bosses, it’s not exactly an action game. 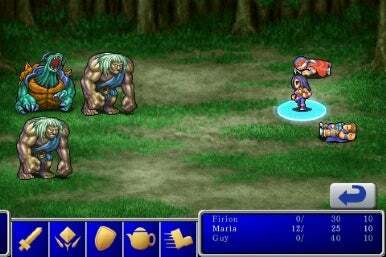 Those new to the RPG genre might find other games more approachable as an introduction, but if you're a fan of the Final Fantasy franchise, you'll definitely want this release on your iPhone or iPod Touch.